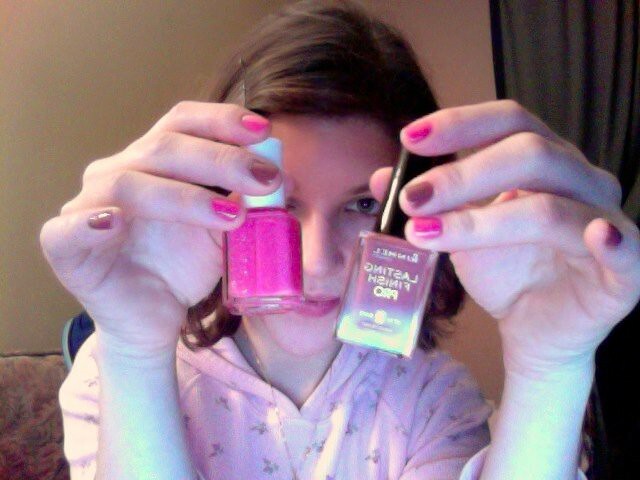 I painted my nails like ice cream colors tonight, which is kind of ironic considering I used to hate dairy. Even ice cream grossed me out. I finally started to like ice cream in my teens and cheese in my twenties but milk and yogurt are pretty much always out. Milkshake has never even crossed my lips because the texture looks so weird and unnatural. Every time I look down my nails make me smile thinking about chocolate and strawberry ice cream. Its been cheering me up immensely because I'm still mulling over the weekends drama and whether or not to post what I wrote about it here. I'm worried about being judged by people I don't know, thinking I deserve what happened, telling me to stop asking for pity. Its not really about that, its about me needing to get it off my chest so some of this emotion can dissolve. 1. Canon has assured me that I will have my DSLR back tomorrow evening so regularly scheduled blog fun can resume. Let me tell you, I have plans! ah milkshakes are theee best! hahaha super cute nails! The blog community is pretty supportive usually. If you do need to get it off your chest, here might be the place to do it. Cute ice-cream nails... I can't believe you don't like yoghurt though! Writing is cathartic and will make you feel better. Your real friends here will support you and possibly even help you understand things better. Aand anyone who is critical isn't worth paying attention to. I'm not a huge dairy fan either - only cheese, which I recently cut out when I went vegan. I think that if you are looking for some potential advice and want to get something off your chest then blogging about it can be really helpful, but it's a personal choice. Damn, last night I painted my nails a shade very close to the hot cocoa you have there. 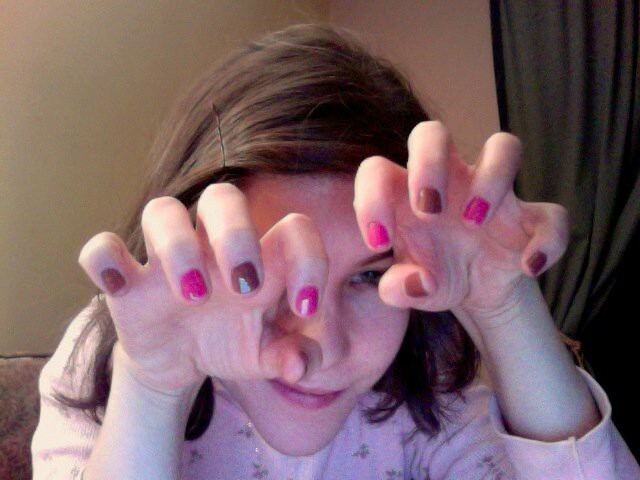 Then, I decided it would look cool and hip and whatnot to add a big, dark purple stripe down the center of them. As you can imagine, my shaky hand and I totally ruined the hot-cocoa shade, so now my nails are totally dark purple, and it really doesn't look so good. And then, I forgot about my nails and decided to scratch my leg, so three of my nails got all weird and smudgy. I think I'm just going to start going au naturel soon. And I say, if it makes you feel better, write about it! I'd love to read it, and no judgement--I promise. P.S. Thank you for your sweet, sweet comments! I use a tripod and self timer dealy when I take my pictures. It takes lots of practice to get used to (I have so many out of focus pictures), but many of them turn out pretty nice! Anyways, I'm sure you wouldn't be criticised if you posted about the weekend. If you're not sure though, just write it in a draft & think about it i guess! Umm you totally have me curious about your weekend drama! Maybe I'm just nosy, if so I apologize! I couldn't survive without milkshakes! You're missing out. i even think my blog is purely personal or whatever it is that happened to me, i write it down. it's like an online journal and the outfits are just the icing on the cake.